During your stay, you will traverse the vast limestone plateaux of the Causses, where the lovesick Robert Louis Stevenson and his donkey, Modestine, travelled in 1878. You can picnic beneath vast plunging gorges, cool your feet in fresh mountain streams and visit the ancient rock city of Montpellier-le- Vieux nestled in the shelter of sheer cliffs. In the Cevennes National Park, there are over 4,000 species of wild flowers, including 80 different orchids, and countless species of colourful butterflies. Graceful vultures soar high above the dramatic gorges of the Tarn, where beavers have recently been reintroduced into the rivers. There are fabulous caverns here too - plus fantastically eroded rock formations with names like 'Anvil' and the 'Vase of Sevres'. 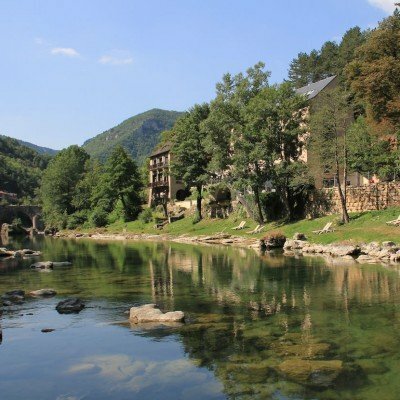 This dramatic region, hardly known even by the French, really is La France Profonde in every way, and it's an ideal location for exploring on an independent walking holiday. It is an area of spectacular scenery and offers a multitude of 5-star beauty spots and places of interest. Above all, it is a place of personal discoveries, an unspoilt paradise for lovers of nature.